Users will also be able to use Skype's instant messaging service, 3 said. Skype has about 246 million registered users worldwide and is one of the firms reshaping the global phone industry. To date, mobile phone companies have been unwilling to let users freely access Skype via their handsets for fear that it would hurt their business. 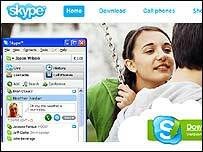 While it is possible to access Skype from a number of handsets, this has involved downloading third-party software, something that has put off the majority of users. The Skype-phone will be the first instance of a phone operator launching a mass market device that is designed to allow free calling over the internet from a mobile, 3 said. "It takes an innovative operator... to challenge traditional thinking and offer the kind of product other operators are still shying away from," said Skype's acting chief executive, Michael van Swaaij. "It's is now truly mobile. Skype has now taken a giant step forward in the mobile arena. And chief executive of 3 UK, Kevin Russell, said the firm wanted to make mobile internet more accessible. "Services need to be simple to access and affordable," he said. "Mobile has the potential to massively increase access to internet calling." The service, launching on 2 November, will be accessed by a button on the handset. As well as the UK, the 3 Skype-phone will be launched in countries including Australia, Denmark, Italy and Hong Kong. Pay as you go customers will have to top up their account with at least £10 each month to qualify for the free Skype-to-Skype calls, 3 said.